Pearl Jam front man Eddie Vedder returns to Ireland to play a solo gig at the 3Arena on June 3rd as part of his European tour. Glen Hansard, who previously toured with Vedder in 2017, will play support at the Dublin gig, as well as dates in Portugal, Spain and Germany and Vedder will end his tour on July 6th in London supporting The Who. Public tickets priced €69.50 go on sale on Friday, March 22nd at 10.00am, while a special pre-sale for current members of Pearl Jam’s Ten Club starts today, Friday, March 15th, for select dates. Full details at pearljam.com. Vedder, who has fronted Pearl Jam since 1990, last played Dublin’s 3Arena in 2017. On the night he brought Hansard out on stage for versions of The Auld Triangle and Falling Slowly from the Once soundtrack, and also played covers of Bob Dylan's Masters of War and Neil Young's Rockin' In The Free World. He played thirty-three songs that night and following the show, rumours surfaced on a Pearl Jam's message boards that the singer walked off stage during the concert to sign a cheque for €25,000 as a penalty for breaking the 3Arena curfew in order to allow him to continue to play and returned to the stage. Vedder lost his voice on Pearl Jam's tour last year and the band was forced the to postpone their show in London’s 02 Arena show, the first time they had ever had to postpone a gig for this reason. 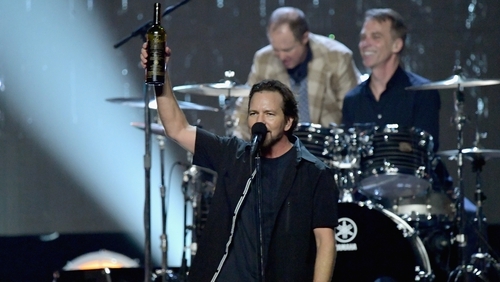 Vedder released his debut solo album in 2007, a soundtrack album for the film Into the Wild for which he won a Golden Globe for the song Guaranteed. In 2012, his second solo album, Ukulele Songs, received a Grammy nomination for Best Folk Album.